A palate invading, sensory addictive fiery pork paste from Calabria. It's the must have ingredient for a bit of a kick! 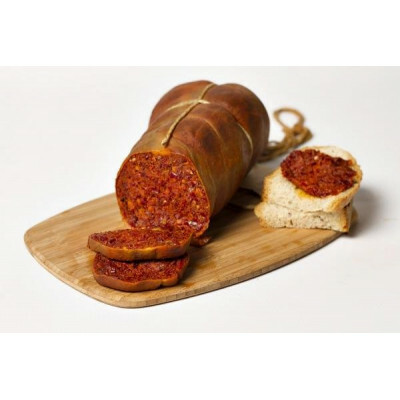 'Nduja is a unique salume from Calabria: a soft spreadable salami obtained from selected pork meat, flavoured with top quality chili, matured and smoked in a natural way. The strange name is related to the French andouille and, though nduja is also packed into that rather worrying lower end of the gut to form its singular shape, it has nothing to do with the much more polarising (and let's face it, poopy) andouillette. Thinly spread on toasted bread, on pizza, used as a base for a stew or in a pasta dish with shellfish or stuffed squid, it spreads its rich flavour and tingling spiciness in the subtlest way right into the part of the brain that stores the best memories of food. You will want more.